Cheyenne Filtered Cigars is the brand that pioneered the filtered little cigar. 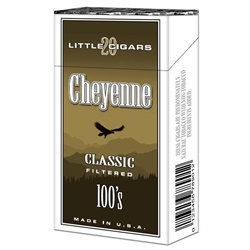 Cheyenne's are medium bodied and have a mild to medium cigar flavor to them. Each of these filtered cigar are wrapped in a thin tobacco leaf paper that allows the burn to be natural and soothing instead of harsh burning chemicals. Cheyenne filtered cigars are designed to provide each smoker with an ultimate sensation of what true regular tobacco should be like. Cheyenne filtered cigars will never disappoint even slightly, so indulge in this great experience for the price now! Switching to filtered little cigars is a great way to save money in an over-priced world. Here at Smokers Discounts believe you should too! We’ve made it easy and affordable to buy filtered cigars online. Call us for more details!